Musicians are just so lazy. 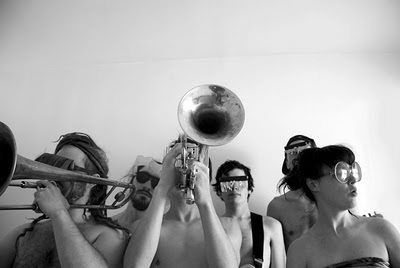 I had to push back a scheduled interview half an hour because singer and trumpeter Alex Toth of Rubblebucket was sleeping? At 6:30 p.m.? Jesus. Ok, so apparently he and his bandmates were up all night shooting a music video in a graveyard. I guess I can let that slide. Besides, Omega La La is one of my favorite albums released this year. I still feel like I can’t describe it accurately. It’s like the Talking Heads added an afro-soul brass section and started experimenting with in depth layers. And even that, I feel, doesn't get the point across. After seeing their music videos for "Came Out of a Lady" and "L’Homme" as well as probably my favorite set at North Coast Fest last month, they’ve solidified an official seal of approval from yours truly. Wanna see them in action? They’re playing this Friday, October 14th at Double Door (9 PM, 21+, $15). For now, read on to find out what a n’goni is, David Lynch’s influence on the band, ghosts, and probably the only band that will directly reference stone masonry in an interview. WCR: What is a Rubblebucket? Alex: Rubble (space) bucket is an industrial grade construction tool that is also used in disaster cleanups, you know, for earthquakes and whathaveyous. In Vermont, in stone mason culture, apparently a Rubblebucket is also a tool used, a smaller tool used for building walls and stuff like that. And then there’s a band. And that’s us [laughs]. Is there any reason you chose it as your name? It wasn’t some deep selection process. Initially there was a session of musicians that came together at this art party at a milk bottling plant in Burlington, Vermont. It was a pretty wild party. And we were just making up all of these very fiery arrangements on the spot, making up melodies, and there was a rhythm section and a bunch of percussionists. It was a pretty weird instrumentation. That night, the place was called ‘Rubblebucket’ something or other. And when you go to make a band name, it can be such a grueling process, like how do you choose this or that? So we had a couple of ideas and at the end of the day that one had the most meaning. One of the percussionists, who’s now our percussionist, he’s a stone mason and he named it that. Speaking of weird instruments, I saw you guys last month at North Coast Fest and there was this weird, sitar like sort of instrument, I had no idea what it was. I just now went on Wikipedia for your band and I see this thing called a n’goni. Where did you find that thing? It’s all tied into why our bands named Rubblebucket. So at that session, I caught sight of this percussionist Craig Myers, and basically, he’s an inspirational musician--he never went to school for music, he never went to college at all. Straight out of high school he started traveling the world and the country like a total gypsy, and then a self-taught drummer. Then he went to Africa for a few years where he was taught not only how to play the n’goni, but how to make n’gonis. He’s a very unique musician. So now, even though we’re in different cities, he wants to get extremely serious about doing music full time, professionally. He’s very dedicated. That’s how that worked out. I don’t actually write for the n’goni for the very reason that if Craig can’t do a gig, we can’t not play a whole bunch of tunes. He’s in some other bands and he’s trying to make a living--it’s hard as an 8-piece band, you know--and he’s kind of older, too. You mentioned you’re an 8-piece band, and that Craig’s not always with you guys. Is it always shifting like that, is there a main core? I always see you and [singer / saxophonist] Kalmia as the heads of the band. Is everyone else full time or is there a rotating cast? How does it work? All eight people are in it to win it, so to speak, every time everyone wants to be a part of this thing. And see it go as far as it can go. Including Craig, we have five original members and two guys on guitar and drums, Ian and Dave, we’ve had them for two-and-half years. Basically when we started touring seriously it became a full-time band. And Kalmia and I left this other band we were in called John Brown’s Body and the cast sort of solidified, and since then everyone’s been pretty much in it. We’ve had to rotate for percussion and bass a lot, and actually, our current [bassist], Jordan Brooks, who’s on a lot of Omega La La, he’s from Chicago actually. It’s just the reality that it’s going to take time solidify a lineup that big. One of the advantages also, since you have, especially the brass section…it allows you to go in the crowd--brass is loud enough where you don’t need to be mic’d: you started a conga line. It was a lot of fun, it was great. Is that common? Watching your music videos, they’re pretty far out, to say the least. I gotta imagine they’re inspired by other artists--visual artists, filmmakers…Anyone in particular that inspires you outside the realm of music? I feel like David Lynch has a big role in a whole bunch of those music videos. There’s just a way that he can take a scene and turn it into a really uncomfortable moment, in a way that’s so unique. Like you’ll look at this scene or this sequence, and there’s just something about it that’s extra fucked up. He manages to do something that’s just weird and surreal. I also think, to a certain extent, are you familiar with Tim and Eric Awesome Show? Heard of it, but haven’t seen too much of it though. It’s pretty brilliant. That, and like Dan Deacon…I like the idea of Dan Deacon. I haven’t checked him out too much but I like the idea of what he’s all about musically. He’s really trying to take the live show into this whole other realm, beyond the standard, there’s your audience, here’s your person playing music, and it’s this one way delivery, he’s really experimenting with that format and trying to break it open. And he’s done some really wild videos. There’s something called Drinking Out of Cups…just weird humor that pushes boundaries. It’s an extension of our music, just trying to push things around a little bit to make them as interesting as possible while not distorting the point we’re trying to get across. Because the last thing you wanna do is go too far, just to do weird for the sake of weird. It’s gotta be more of the purpose of shaking somebody up and bringing them some place really fun and fresh. So one thing I’ve learned about you guys, from the live show, music videos, is that you’re very colorful. You’re getting laser eye surgery tomorrow and it will tint the world into one color. What do you choose? It’ll tint the world into one color? Interesting. [pause] Here, I’m gonna ask Kal. [background mumbles] Kal says rose colored. [pause, background mumbles] That’s symbolic, but she doesn’t care. And then for me I’m gonna say blue.